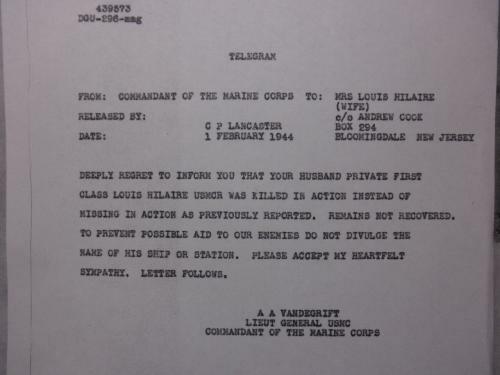 PFC Louis Hilaire was born in Paterson, NJ on May 26, 1922, the son of Andre and Ella Hilaire of N. Haledon, NJ. He enlisted in the Marine Corps in New York, NY on August 11, 1942 and trained at Parris Island. He was assigned to Co. I, 3rd Battalion, 21st Marine Regiment, 3rd Marine Division on October 4, 1942. Hilaire sailed from San Diego on February 28, 1943 on the SS Lurine and arrived at Auckland, NZ March 3, 1943. He then sailed aboard the USS George Clymer on July 23, 1943 and disembarked at Guadalcanal on July 30. 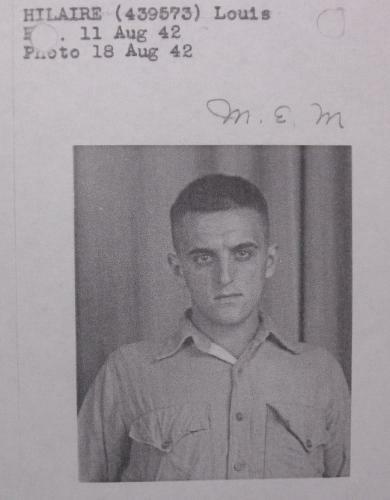 He sailed on the USS McKean, APD-5, on November 15, 1943. He was KIA/MIA on November 17, 1943 when the USS McKean was torpedoed and sunk 19 miles off Torokina, Bougnanville, British Solomon Islands. He was married at the time. He is memorialized at the Tablets of the Missing of Manila American Cemetary, Manila, Philippines. Following the American naval victory over Japanese forces in the Battle of Empress Augusta Bay during the darkness of 2 November, USS McKean, APD-5, steamed with a reinforcement convoy to Bougainville and on the 6th landed Marines near Cape Torokina, Empress Augusta Bay. She carried additional troops to Bougainville 11 November, thence returned to Guadalcanal for yet another troop run. With 185 marines embarked, McKean sailed up the slot late 15 November. As she approached Empress Augusta Bay early 17 November, she was attacked by the SFPO Gintaro Kobayashi's (of Imperial Japanese Navy Air Service's 702 Kokutai) Mitsubishi G4M "Betty"  torpedo plane, which launched a torpedo off the starboard quarter. McKean turned to avoid the deadly weapon; but at 0350 the torpedo struck the starboard side, exploding the after magazine and depth charge spaces and rupturing fuel oil tanks. Flaming oil engulfed McKean aft of the No. 1 stack, and she lost all power and communications. Burning oil on the water killed men who were blown or jumped overboard. Her skipper, Lieutenant Commander Ralph L. Ramey, ordered her abandoned at 0355; at 0400 she began to sink by the stern. He went over the side 12 minutes later; her forward magazine and oil tank exploded at 0415; and her stacks disappeared at 0418. 64 of her complement and 52 of her embarked troops died from the explosions or flames. The survivors were picked up by destroyers. 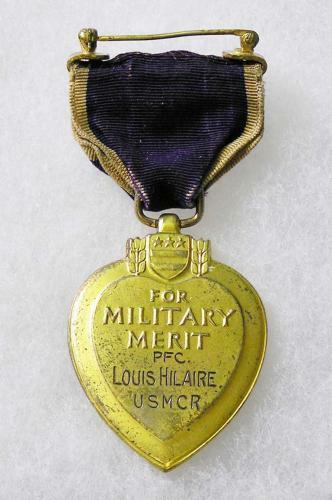 PFC Hilaire's posthumous officially engraved Purple Heart is a sterling silver Type 1 manufactured by the US Mint. Accompanying the group is Hilaire's complete record from St. Louis. As of 2012, some new information shows that PFC Hilaire was from North Haledon, New Jersey, and was in the Hawthorne High School Class of 1940. The high school yearbook of 1944 lists Pvt. Hilaire as killed in action. He would have been 21 years old at his death. On this website, see also the write-up on CY Frank C. Furbush who was a Navy survivor of the sinking of the USS McKean.